Quick, flexible, inspiring and profitable at the same time: these are the parameters for a contemporary business. The prerequisite for this is mastery of the digital supply chain. Up to now decision-makers and executives have lacked a model that assembles the viewpoints of customers, employees, their business and the competition to create a coherent overall picture; that would offer an overview, structure and assistance in implementing the digital supply chain. The Exploded View invented by Jonathan Moeller is a remedy. 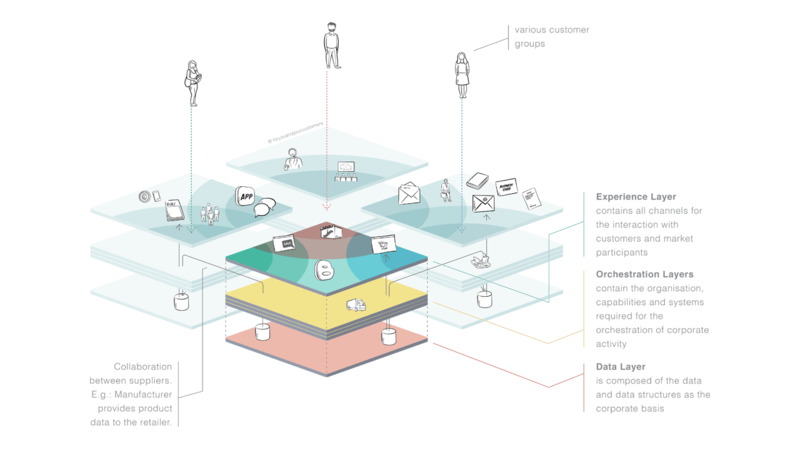 It is a model that visualizes companies’ own experiences and potentials and shows how they can be successful in a digitized world with the know-how they have gained. More about the Exploded View can be found here. “Work in progress”, said a satisfied Stephan Mueller, extending his hand to bid his interlocutor goodbye. Müller returned to his seat at the head of the table in the conference room of a major German retailer. White walls, white table top, a rough grey concrete ceiling, interrupted only here and there by bright, funnel-shaped LED lights. Only a few minutes prior, at this very spot, he had completed his presentation before the entire management board; the ceiling- mounted projector was now whirring loudly, cooling itself back down to operating temperature while still shining a model at the wall, drawn in painstaking detail and consisting of several planes, various towers, connecting lines and numerous icons. The model read: “The Exploded View: How to Succeed in the Digital Supply Chain” and was identical to the title of his presentation. The traditional supply chain: purchasing, production, distribution – and then what? “Good times”, some readers who are involved in the topic will think to themselves, before supplementing the first thought with: “times long gone”. The traditional supply chain is – unquestionably – business-relevant, but it is no longer decisive by itself. The missing piece of the puzzle is digital supply chain management. Digitisation leads to a large number of questions in companies regarding the handling of the data volumes obtained. Nowadays, globalisation and digitalisation – or, to use the buzzword, ‘the digital transformation’ – are prompting more and more organisations to constantly expand their own flow of services, repositioning themselves internally as well as externally. To accomplish this, however, it is not enough to conjure up an online shop at maximum speed out of thin air, toss mobile apps onto the market that do not harmonise with a company’s own point of sale or its online shop, and inundate customers with campaigns that have not been thought through. The steps known as ‘quick wins’ are anything but sustainable solutions deeply anchored within the enterprise. The number of channels involved – be it mobile apps, online shops, websites and even ecosystems such as Amazon and the like, which distribute the products of countless manufacturers the way retailers do – has undergone a virtual explosion in recent years. For enterprises, the resulting flood of information means that they must deal not only with classic data types such as product data, vendor data, employee data or customer data, but also with data types such as user-generated content. More than simply deal with these data types, they also have to process them, embed them, enrich them and make them available again – for internal and external purposes. 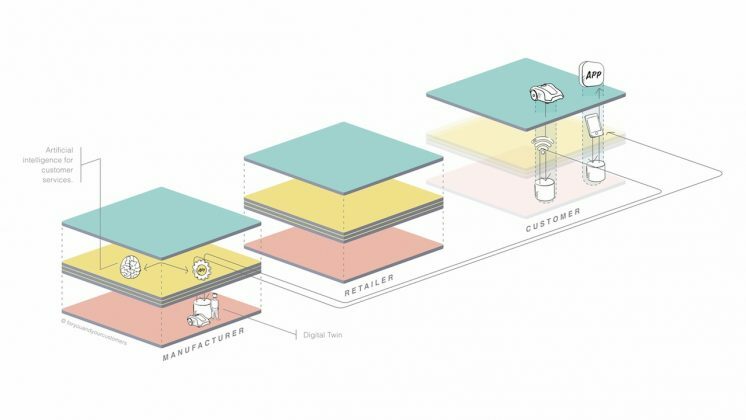 In a successfully run digital supply chain spanning the entire process – from the concept, design and production of whatever a company performs or manufactures, to delivery and feedback – all of the necessary data and digital building blocks generated and derived over the course of this process dovetail with one another seamlessly and efficiently. This is for instance how an organization’s product data from the Data Layer is deployed to the Experience Layer through the Orchestration Layers. 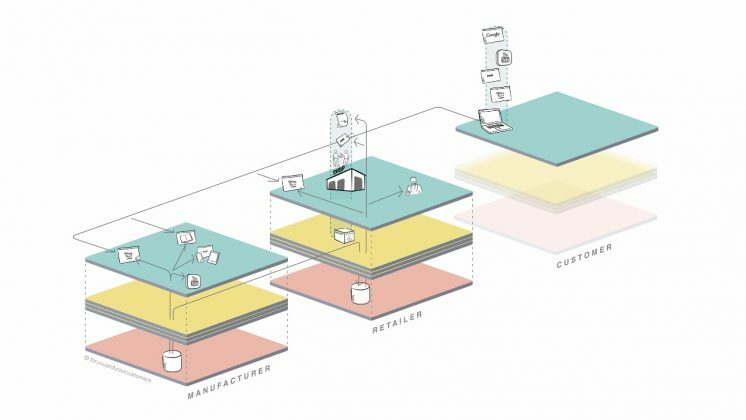 Parallel to this, the company feeds the same product data into the database of relevant sales partners and retailers to permit them to retrieve whatever information they need about the respective product, revise it for their own purposes and then publish it themselves through the appropriate channels. Information was once packed in simple texts about a product’s length, width and height, for instance. Today, the array of data required by a company’s own point of sale, website, online shop and assorted social-media channels, not to mention service providers, business partners and retailers interested in presenting, offering and selling their own services now includes photos and videos and even 360-degree images or data for augmented reality applications. The data flow is created, for example, by apps that are used, websites that are visited, links to promotional e-mails that are clicked on, etcetera. Here, the customer has a product connected to the internet. This continuously transmits status information to the manufacturer, which manages the data (as a so-called ‘digital twin’ of the individual article) and provides the customer with password-protected data. This can easily be illustrated, for example using the Philips ‘Hue’ with integrated motion detection, the lighting system by the electronics group of the same name. Rather than use a light switch, one’s own four walls are illuminated using a free mobile app activated via iPhone or tablet, or else the lights go on automatically when a room is entered. All of the data in which this results, such as motion-detector data, usage data, contact data, location data and information provided by the user, such as feedback, opinions, reviews, comments and much more, is transmitted to the manufacturer via Wi-Fi. “For a company, this means that the effort required to process and use this volume of data is immense and at the same time an essential element of a digital supply chain strategy”, Stephan Müller notes. “It offers the enterprise an opportunity to generate much stronger customer loyalty”, as the business deals directly with the customer and can bind them even more closely through additional offers and services. This creates completely new business areas, sales concepts and services and can launch additional projects and develop and offer products – if the company is in control of the digital supply chain. The Internet of Things (IoT) is generating ever larger amounts of data which, if handled correctly, can increase customer satisfaction. Download the whitepaper “Exploded View” as PDF (8.5 MB).